Whether you tote a light-as-a-very-heavy-feather MacBook Air, or a slightly heavier MacBook, it’s fairly painless to take your laptop with you when you travel for work or play. But many people forget to change their Macs' settings when they move from their regular network to something more public. The settings that make it easy to share your files, music, and photos at home or in the office make it just as easy for strangers to stumble upon your data when you're at a coffee shop or on a cruise ship. Here's what you need to do to make sure your Mac isn't unnecessarily vulnerable when you travel. The first step to making sure you don't share more than you intend is to go System Preferences, select the Sharing pane, and then turn off File Sharing. This will ensure that no one can get access to your files, or put their own files onto your Mac. If you prefer to leave File Sharing enabled because you're sharing files with traveling companions, instead go to the Sharing pane and change the permissions for Everyone to No Access. That way, folks with whom you've shared your username and password (or for whom you've created separate accounts on your Mac) will still be able to connect. While you’re in the Sharing pane, it’s a good time to verify that no unnecessary sharing options are enabled, either. For example, if you never use Remote Login, Remote Management, or DVD, Internet, or Bluetooth Sharing, ensure that those checkboxes are unchecked. And you certainly wouldn’t want to allow password-free Screen Sharing, either. Now you’re safe, right? Not so fast! If you’d prefer to keep your data truly private, there are a few other settings to tweak, too. If you’re launching iPhoto to import photos from your travels, you may want to verify that you’re not accidentally broadcasting your family’s photos to anyone who cares to look. In iPhoto’s preferences (iPhoto -> Preferences), click on the Sharing tab, and make sure that Share My Photos is unchecked. If you forget to turn off iPhoto's sharing preference, you risk accidentally broadcasting your family's photos to everyone on any Wi-Fi network you join. 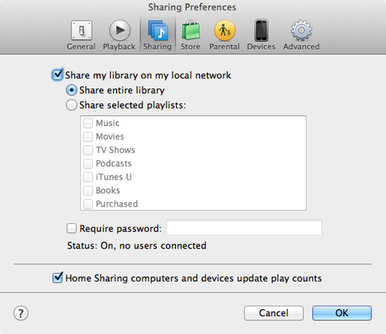 Likewise, turn off iTunes sharing before you join a network on the road. Or, if you prefer, require a password instead. You’ll need to make a similar change if you’d rather not have your Mac serve as a remote jukebox for anyone on the same Wi-Fi network as you, but you still want to rock out to iTunes yourself. Click on the Sharing tab in iTunes’s preferences, and uncheck Share My Library On My Local Network. Note that despite your preparations, you may still discover other users’ computers are attempting to broadcast their information to your Mac. Other computers may show up under the Shared sidebar in the Finder, and other photo and music libraries may appear in iPhoto and iTunes, respectively. Though you can see them, that doesn’t meant that they can see you or your data. So long as you disable the sharing features that would otherwise leave your data publicly accessible, you can trust that your Mac, at least, is secure.